There is nothing better on a hot summer day than being able to take a cool and refreshing dip in some nice cold water. The only problem is sometimes it takes fighting through traffic while driving to the local public pool or the beach to do it. Well a company called Intex has a solution to that problem. Now in less than a day or two you can have your own backyard swimming pool set up and ready to use. With a large variety of pool choices, pool sizes and pool equipment everyone can find the best above ground pool from Intex that fits their needs and fits their budget. How does Intex do it? They make their pools in a special way so they come from the factory in a very easy to install form. All you have to do to install any of their pools is to level the area where the pool is going, bring in a small amount of sand and then follow the easy to read pool setup instructions. Once the pool is in place and filled up with water the pool pump can be turned on to start circulating the water. After adding the necessary chemicals to sanitize the water in a few short hours the whole family will be enjoying swimming in their own backyard pool. It really is that easy to enjoy and to own an affordable swimming pool from Intex. Which One of these Intex Swimming Pool Models do we prefer? 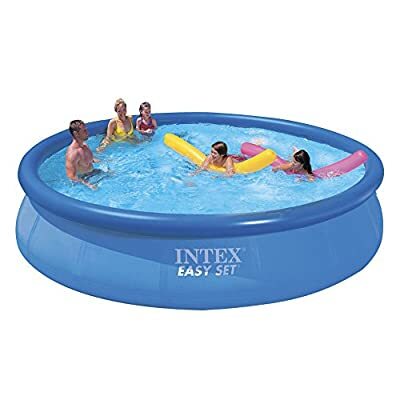 If you are on a fixed budget, have smaller children and don’t want the hassle of setting up and maintaining a larger swimming pool, then this great little model from Intex is perfect for you. It is priced to fit any budget yet still comes with many nice features for the price. Despite its smaller size it is one of Intex’s highest rated and best-selling models. We were not kidding when we said this pool was easy to set up either. The manufacturer states that after the ground has been leveled and a layer of sand put down it takes less than 30 minutes of time before you are ready to start adding the water. You also don’t need to allow for any bracing when figuring if this swimming pool will fit in the space you have in your yard or not because round pools support themselves because the pressure is equal all the way around. The sturdy laminated PVC construction it is made of will hold up well for many years to come too. Why is it great for small children? It’s because this pool is only 36” deep. That means that for many children it will not be over there head and they will feel much more comfortable and have much more fun swimming because of it. It is one of the smallest depths that Intex pools come in. Most small swimming pools don’t come with pump and filter setups either but this one does so you will have no trouble keeping the water clean and safe for your kids to swim in. The pump can be hard wired or conveniently plugged into any 110 volt GFCI protected outlet. It also has duel suction fittings for safety and a convenient drain plug to empty it when you are ready to take the pool down after the swimming season is over. Our next Intex pool to be reviewed is a little bigger and deeper than the one previously looked at. It is a great pool for the family to enjoy and for entertaining small groups of friends. It will turn any plain backyard into the center of attention at your home during the warmer months. It is another one of Intex’s swimming pools that installs very fast once your ground has been leveled and you have covered that area of ground with the required layer of sand. If you follow the easy installation directions on the DVD that is included in the kit you should be able to have this Intex model pool ready for water in less than 1 hour. This kit comes with many nice features too that make it easy to keep clean and easy to set up also. There is a ground cloth that is included to put over your layer of sand to keep the laminated vinyl the pool is made of from directly contacting the ground. It also includes a surface skimmer that will make it easy to get leaves and other debris off the surface of the pool. This Intex model swimming pool also comes with a debris cover that is great for those times of year when leaves or other falling foliage tend to land inside your swimming pool on a regular basis. What is the best feature of this great 18 foot round swimming pool? It has to be the pump and filter system that has a built in saltwater purification system. Saltwater pools will save you money on chemicals, are much easier on your skin and eyes and are just as effective at keeping your swimming pool clean as regular chlorine tablets are. 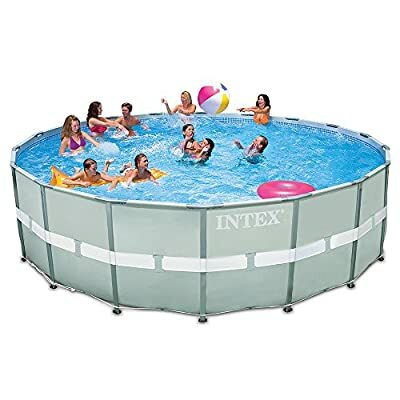 This great rectangular pool from Intex is perfect for those families with older children and those who like to play a game or two of pool volleyball once in a while. Although it does have supports like all rectangular pools must have, it still only takes up 15’ x 27’ of space. That is a pool that is large enough to have fun and relax in but still small enough to fit in any average size backyard. The pool itself is very ruggedly constructed too. It all starts with its very nice looking rigid metal frame which easily slides together and snaps into place. It also has its looks complimented by the beautiful 52 inch deep grey laminated vinyl pool liner that comes with it. Most people would say it has a very contemporary and modern looking design once it is set up and filled with water. It’s a good looking pool that will not be an eyesore in any backyard. This spacious rectangular pool is also very easy to keep clean and there is even a pool cover that is included right in the kit. Intex has included a pool pump with some good power with this pool kit too. The pump that is included will filter a whopping 1,650 gallons per hour. That means it will filter all the water in this Intex rectangular pool in less than 6 hours which translates to having pool water that is very safe, very clean and the water is sparkling clear. There are a few other nice features that come with this beautiful looking above ground pool too. On the inside of the vinyl liner it has a blue tile look imprinted on it that adds a nice touch to its already good looks. It also includes an in-pool ladder to make the swimming pool easy to get in and out of. 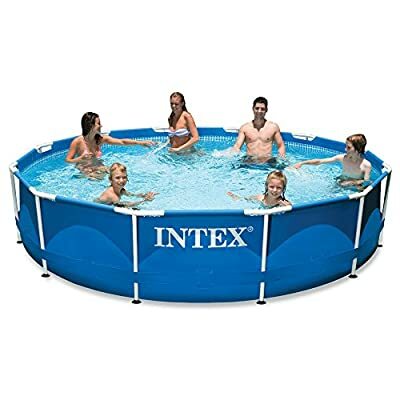 If you have toddlers or are on a tight budget yet still want to own a nice little backyard swimming pool, then this is the Intex pool of choice for you. It is only 30 inches deep which means that almost any child who uses it can stand without the water being over their head. Its low height also makes it ideal for adults who are supervising their children from outside the pool to be able to keep a close eye on them. 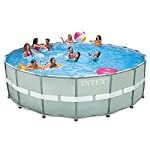 And the highly affordable price on this round pool will surprise many people when they are shopping. This pool has a lot more to offer than just an inexpensive price point and being shallow too. It is extremely easy to set up and get running. Just as the other pools that have been reviewed here you need to first level the ground and put down a layer of sand. The painted steel support structure takes up no extra room since it is a round pool and this means it can fit even in a small backyard that has 15 feet in diameter of free space (12’ for the pool and a few extra feet to safely walk around it). This pool can literally be up and running in as little as a half day. That makes it a great buying decision for that last minute pool party to surprise one of your little ones on their birthday. Intex did not skip on features for this pool either despite its smaller size. It is made with the same thick PVC sidewalls that come on the bigger round pools that they manufacture too. It has a Kristal clear cartridge filter and pool pump system that will clean over 500 gallons of pool water in an hour included in the pool kit also. Add to the mix a convenient drain plug that makes this pool easy to drain and store when not in use and you have a really nice item here. When you start shopping for a swimming pool you want to be an informed buyer for sure. You need to know what type of pool you are interested in buying (round or rectangular), what types are available in your area, whether you will buy it from a pool company and have it installed by a professional or whether you want to keep it simple and do it yourself. The more research you do as far as the different types of above ground pools available, what they are best used for, how long they last and the different accessories and features available with them; the better you will be able to make an informed decision and get a swimming pool that is perfect for your needs. So start by familiarizing yourself on the internet and at pool stores with what is available in the above ground swimming pool marketplace. After you get a good idea of what is out there in the above ground swimming pool market you next have to figure out what your budget is for the best above ground pool purchase that you want to make. This will help narrow down your choices because some model pools will simply not fit in your budget at the time so why bother looking at them further. Make sure you factor the price of ground preparation and the installation of the swimming pool into the price too if you will have these professionally done for you. It’s not just good enough to know how much your pool itself will cost to purchase and install either. Swimming pools chemicals are not cheap to buy and the bigger the pool the more chemicals you will need to treat it. So make sure you allow a season’s worth of chemicals in you pool purchasing budget too. In order to get the right size swimming pool for you it is important to determine how many users will be in that pool on a regular basis. Maybe you only have a family of 6 people but if that includes 4 children who will bring a friend to swim each day then the number of pool users has quickly jumped to 10. Something like a 12 foot round pool is simply not going to be able to handle that many swimmers on a routine basis. Knowing the age of the bathers that will be using your swimming pool is important also. Just because you know that only your family of 6 will be using the pool is not good enough. If your family consists of 4 children under the age of 7 then you might want to consider a swimming pool that is only 30 – 36 inches deep. 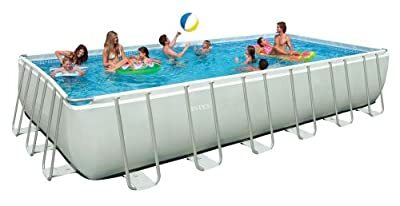 If your children are older than that you would want a deeper model pool such as a 52 inch one and you would also want something that is built to handle the rigors that older children will put on the pool as they use it. Simply put, it’s a no brainer that the pool you buy must first of all fit in your yard. At the minimum you have to have enough space to both set up the pool and comfortably walk around it. You always must allow room for any support structure that is attached to rectangular shaped above ground pools too. If you are buying an above ground pool you also have to have a vision of what you eventually want your pool area to look like and make sure the swimming pool size you choose will allow you to accomplish this. Pool buyers regularly do such things as pour concrete patios near their pool for an area to barbeque and set up chairs. Many pool buyers will also build decks around their swimming pool too. The pool you purchase must not take up all the free room in your yard if you want to do one of these other things too. This one is a biggy and there is a lot that falls under this topic. There are many different options these days in the swimming pool marketplace as far as pumps and filtration equipment go. For pumps you want one that is big enough to circulate and filter all the water in your entire pool at least two times a day. That means if you have a 12,000 gallon swimming pool you will need a pump that moves at least 500 gallons per hour to circulate the volume of water in two times in one day. There are also different types of filter systems available for above ground pools. DE filters work the best but are the hardest to maintain and clean. Cartridge filters are easy to clean and maintain but might not be practical for bigger above ground pools. Sand filters are a good happy medium but are not allowed in some areas due to the fact you constantly need to clean them by releasing water out of the pool and onto the ground. Familiarize yourself with both the local codes in your area regarding above ground pools and also be aware of neighborhood rules for swimming pools too. Some city codes require such things as fencing for above ground pools and set minimum distances they need to be away from buildings and property lines. Some neighborhood communities do not allow you to put an above ground pool in your backyard also. Safety may be mentioned last on this list of considerations but it is an important one to say the least. Make sure that whatever you choose to do as far as the location and setup of your pool it is done in a safe manner. Keep swimming pool equipment that runs on electricity enclosed by a protective barrier and make sure you have a way to limit access to the inside of your above ground pool when you are not using it. Although all of these pool products are easy to set up, look great and will provide a family with many hours of swimming fun; the best pool to us is the Intex Rectangular Ultra Frame Pool Set that measures 24-Feet by 12-Feet by 52-Inch deep. For one thing it was the versatility of its rectangular shape. It allows you to do more than round pools do. It’s not only great to swim in but you can also easily play fun games in it too. Many people will get add-ons such as a volleyball net or basketball hoop and spend many hours enjoying these in pool games. Another selling great selling point is both the looks and sturdiness of the swimming pool itself. The steel frame and side supports give any homeowner a lot of confidence with this pools ability to handle wear and tear and the nice shiny finish of this steel framework enhanced the look of this swimming pool too. The appearance was made even better by the way the white coping blended in with the grey exterior and on the inside the printed blue pattern with tile made the water look so inviting. The powerful filtration system that comes with it is impressive too. A pump that will circulate over 1000 gallons of swimming pool water in an hour is impressive to say the least. That means all the water in this swimming pool will pass through the filter and be cleaned at least 4 times per day. That is twice the recommended amount of filtration. This also will help keep this pool very clean which is great because you want to spend more time having fun swimming then you do trying to keep your pool looking good. This pool simply has a hard combination of features to beat. What pool owner does not want a sturdy pool that looks great and is easy to keep clean? So when you look at all these things together you definitely have a swimming pool here that has so many nice features that it should be right at the top of any list of the best above ground pool to buy.